TOM: My Bookcase Showcase is a bit of a cop-out, I'm afraid. 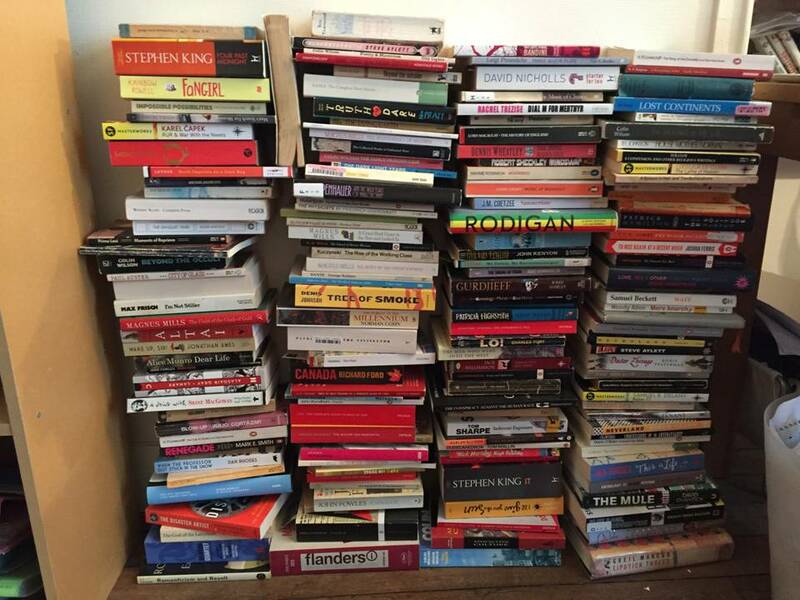 I live in France at the moment, so all my books are currently dustily packed away in my parents' back room in London. What I've got here in Paris is basically stuff that I've bought over the past few months, or things I brought with me that I knew I couldn't live without. The most important in that second category are definitely 'At Swim-Two-Birds' by Flann O'Brien and 'The Secret Diary of Adrian Mole' by Sue Townsend - my two favourite comedy books, and the books that made me want to be a writer. They're both about disgruntled, bookish adolescents - which is basically the blueprint for most of the characters I've written so far. There's also David Nicholls' Starter For Ten and Rainbow Rowell's Fangirl, both of which are brilliant, funny, moving novels about going to university, and which we read and re-read while writing FRESHERS. As well as that, I like sci-fi stuff, so have been buying quite a lot of that recently - mostly Ursula Le Guin, who's consistently incredible (check out 'The Lathe of Heaven', or any of her short stories - particularly 'The Ones Who Walk Away From Omelas'). Plus there is some horror (HP Lovecraft, Dennis Wheatley), but mostly Stephen King. It's not very original to say - but he really is so brilliant. I had to write an article recently on the film version of 'It', so I was re-reading the novel, and had forgotten how amazing it is. 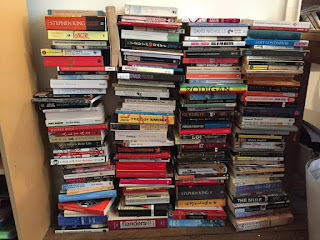 There's a couple of music books in there on bands I like, like The Pogues and The Fall, but aside from that, it's mainly just funny books - stuff by PG Wodehouse, Spike Milligan, Rachel Trezise, Magnus Mills, Dan Rhodes and more. Funny books are what I most enjoying writing, so they tend to be what I most enjoy reading, too. Lucy: My bookcases are important to me. They represent who I was at different stages in my life. In the glass cabinet I have all my most treasured books. An edition of Matilda I got from my Dad on my 8th birthday, The Witches Handbook that my sister and I read again and again until we felt we had the art of being a witch truly mastered, and other childhood favourites like Sweet Valley Middle school (I had over 200 books in the series) and my A-level copy of Sylvia Plath’s Ariel. The actual books really matter to me. If I am writing and want to remember what I was like at a certain age I pick up a book that I loved at that time of my life. I feel the pages and try and remember why I loved it so much. 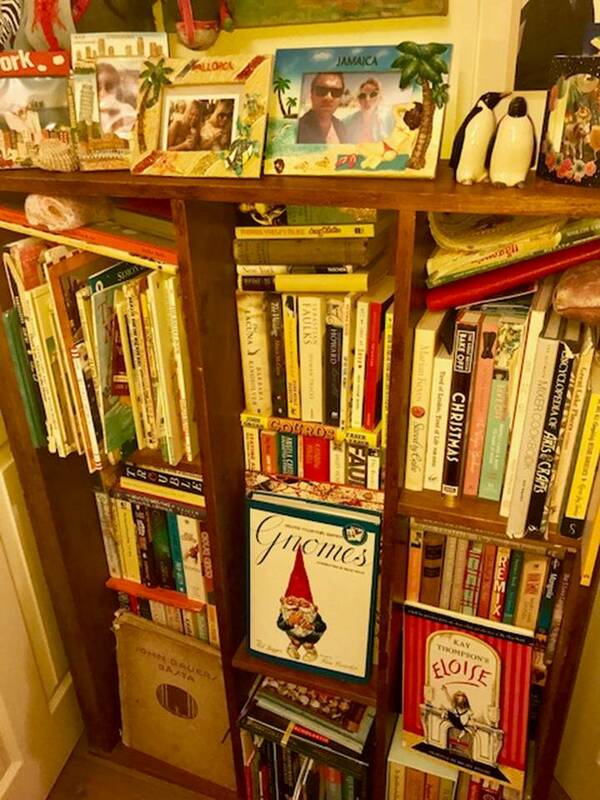 I collect children’s books and my other book shelves is full of picture books like my favourites Eloise and Gnomes, that you can see face out. I change the books that are face out with my mood at the time. I’ve also got some cookbooks as I am a keen baker and a variety of higgledy-piggledy books that I have kept for some reason or another. I think bookcases tell you a lot about a person and I love going into someone’s house for the first time and having a good snoop around theirs!